RVGL has been updated to 18.0720a! For track makers, the ability to customize their tracks for reverse variants has vastly improved. All supported levels files and a few level graphics can now have reverse variants placed in the "reversed" or "custom/reversed" folder. All supported <level>.inf keywords can be customized for reverse mode by placing a "reversed/<level>.inf". The only exceptions are STARTPOS, STARTROT and STARTGRID which must use their REV variants. The shader code has been restructured to generate more permutations and avoid dynamic branching where possible. This should greatly improve performance. It now supports a maximum of 8 Lights and 3 ShadowBoxes per mesh. Further, repetitive error messages on shader compilation failure is now avoided. Uniform Buffer Objects: Buffer-backed uniform blocks are used to store and update shader state which can provide better stability and improved performance when rendering scenes with large number of meshes. Requires OpenGL 3.0, GLES 3.0 or driver support. The feature can be toggled using the EnableUBO key in rvgl.ini. Separate Shader Objects: Shader programs for the vertex and fragment shading stages are generated separately, enabling better reuse of shader code. Requires OpenGL 4.1, GLES 3.1 or driver support. The feature can be toggled using the EnableSSO key in rvgl.ini. Note: Support for these features can be verified from the Video Info section in re-volt.log. Improved translucency sorting: Special effects like sparks, skidmarks, dust and smoke are handled better by the shader renderer. For some background, see the post at [RVGL Shader version] Translucent faces issue. This can be slightly more CPU intensive. A new key SortLevel has been added to rvgl.ini to switch between the new sorting algorithm and the old, simplistic sorting scheme. The target API level has been increased to 21 for compatibility with Android P.
Ultra wide aspect ratios, up to 27:9, are now supported. Antialias support should be working on GLES3 mobile devices. Disclaimer text at the intro screen is more readable. Support for the Basque language has been added, thanks to translation provided by Urtzi of Game Erauntsia. Show confirmation message for Save Car Info in-game option (dev mode). The log file mentions CPU architecture info (x86 or arm). Support multiple gamecontrollerdb files for different SDL2 versions (useful for GNU/Linux systems where the latest version of SDL2 cannot be used). Shaders: Fix lighting glitch in car springs and other parts. Shaders: Fix glitch in reflections of additive blended meshes. Shaders: Fix crash in Objects edit mode on quiting Preview. Fix pure-black issues in BossVolt texture. Fix firework target disappearing in Chase camera view. Fix transparency issues and invisible nodes in edit mode. Fix lines visible through walls in edit mode. present, the game will fall back to the normal version of the file. STARTGRID which must use their REV variants. used for fireworks (disabled by default). Shader Objects. These can be disabled through new rvgl.ini keys "EnableUBO"
- Android: Ultra wide aspect ratio support. - Android: Increased target API level to 21 for compatibility with Android P.
- Avoid repeated error messages on shader compilation failure. - Does not enable shared OpenGL context when using silent load. - Show confirmation message for Save Car Info in-game option (dev mode). - The log file mentions CPU architecture info (x86 or arm). - Android: Better disclaimer text scaling at the intro screen. - Support multiple gamecontrollerdb files for different SDL2 versions. - Android: Ensure on-screen keyboard shown after dismissing message box. - Shaders: Fix crash in Objects edit mode on quiting Preview. - Fix pure-black issues in BossVolt texture. - Shaders: Fix lighting glitch in car springs and other parts. - Fix broken Antialias support on GLES3 mobile devices. - Fix firework target disappearing in Chase camera view. - Fix transparency issues and invisible nodes in edit mode. - Fix lines visible through walls in edit mode. These entries are no settings, they're just for displaying purposes to see which video device and renderer is used. Heads up for those of you on Windows 10: You might run into this when you try to launch the installer. 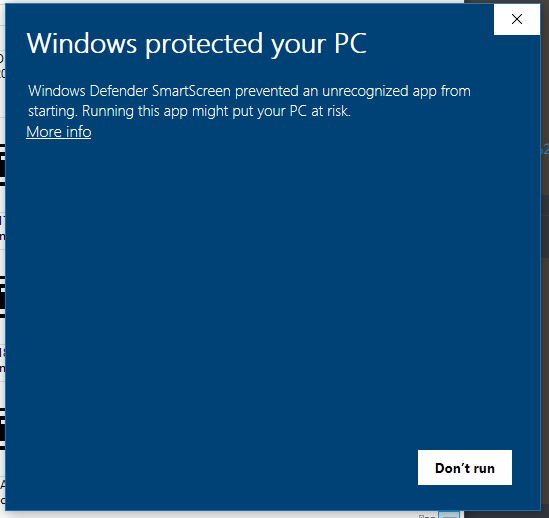 I was able to get around it by turning off Windows Defender, but I figured I should share it in case anyone runs into the same error and panics about it. I think you can also click on More Info and then another button appears to let you run it. Ran into the same issue with 0725 and can confirm that you can just click through it like you said.